Restoration Hardware (NYSE:RH) has been one of the most impressive stocks in the market the last few years. There are other stocks that have gained 300%+ in 20 months, as RH stock has. But most, if not all, of those winners have had sector-wide tailwinds helping those gains. Restoration Hardware simply has been the star performer in the space — and quite clearly, it’s not even close. 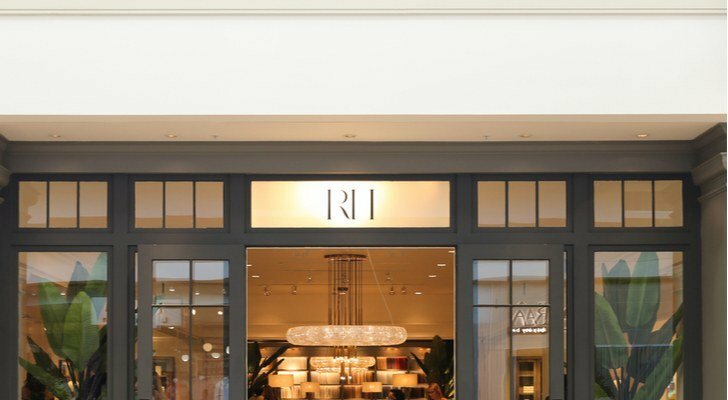 With RH stock down 12% after its fiscal Q2 earnings release, is growth on the way? And how much is priced in, even after Wednesday’s decline? From here, RH stock looks a little too cheap. I liked the stock back in March, and even at a higher price, I still like it coming out of Q2. But with heavy short interest, volatile trading, and a market that clearly is concerned about a sales deceleration in Q2, this is a dip worth nibbling on, not rushing into. The story in RH’s Q2 was that sales growth was slower, and earnings were higher. That is not necessarily a surprise; in fact, it was part of the company’s strategy for the year. But on both fronts, the impact of those strategic changes was greater than expected. The bad news appears to be on the top line. Revenue of $640.8 million did rise 4.1% year-over-year. But that growth figure was a full three points below Street estimates — and beneath the low end of the company’s guidance for the quarter, released with Q1 results. Restoration Hardware management didn’t seem too concerned, and there were some one-time factors affecting sales. Inventory reduction efforts last year had a three-point impact on the comparison, as did higher outlet sales. Comparable brand revenues still rose 5% YOY, a solid figure in a market where peers are happy to post a positive number. Meanwhile, Restoration Hardware is focusing on margins and profitability this year. As CEO Gary Friedman put it on the Q2 conference call, “So people are unhappy with the fact that we took earnings up 14% [from guidance] and took revenues down 2%. Honestly, that’s their problem.” And the bottom-line results seem to validate the strategy here. Adjusted EPS of $2.05 (excluding the net effect of one-time tax and share count effects) was way ahead of guidance of $1.70-$1.77, and consensus of $1.75. Gross margins increased an incredible 800 basis points YOY. Adjusted operating margins nearly doubled to 12.3%, up 590 bps. Full-year adjusted EPS guidance was raised to $7.35-$7.75, nearly a $1 per share increase at the midpoint. That in turn suggests that back-half performance should be better than expected as well. Why Is RH Stock Down? And yet investors are selling RH stock. Combined with a nearly 5% drop on Tuesday, RH fell almost 17% in two sessions. Investors appear focused on the top-line miss, which seems a bit short-sighted here. As Friedman pointed out, RH could have chosen to boost sales by cutting prices. That wasn’t the plan, however. And it’s worth keeping in mind that the plan worked spectacularly. Adjusted EPS — excluding the one-time factors — more than tripled. RH is moving up its target of adjusted EBIT margins in the “low-to-mid teens” up a year. Much of the heavy lifting in terms of pricing, store renovations, and supply chain improvements has been completed. Under Friedman, Restoration Hardware has a clear strategic path. That path so far has led the stock to more than quadruple, even with this week’s pullback. From here, despite the revenue concerns, Q2 seems to show another step on that path. All that said, RH isn’t necessarily that cheap. Updated FY18 (ending January 2019) guidance, excluding the one-time benefit in Q2, suggests a P/E just under 19x at the moment. That sounds inexpensive in a market where 20x+ multiples are the norm. But this is a cyclical stock in an economy heading into year 10 of an economic expansion. Competition from Amazon.com (NASDAQ:AMZN) and Wayfair (NYSE:W) remains a risk. And it’s clear from the reaction to Q2, and the volatility in RH stock the last few years, that investors don’t entirely trust the story here yet. Meanwhile, heavy short interest — still over 40% of the float — both creates the possibility for short squeezes and suggests that at least some savvy investors see the story here as inevitably ending. The story isn’t perfect, admittedly, and neither is the valuation. (Note that most of RH’s peers are trading in the low-to-mid double digits on a P/E basis, with much cleaner balance sheets.) And it’s possible the selloff could continue. Some investors may look to lock in profits, and shorts may be emboldened by what appears to be a decelerating revenue growth profile. I do like RH here, because the long-term strategy works and suggests still-substantial upside. Long-term targets of $7-$10 billion in revenue and low-to-mid double-digit operating margins suggest the company could generate at least $1 billion in operating income. With interest expense coming down after a recent convertible issuance to about $60 million a year, and a 26% tax rate, that suggests something like $700 million in net income. Even a lower 15x multiple suggests RH stock could double over a few years, and the company’s history of aggressively repurchasing shares would add more upside. Right now, that’s not what investors are focused on, however. And so I might recommend a small starter position, or selling puts or put spreads to take advantage of volatility. I do think RH’s run will resume, but it may not happen this week or this month. Article printed from InvestorPlace Media, https://investorplace.com/2018/09/time-to-put-on-a-starter-position-in-restoration-hardware-stock/.